The latest issue of our newsletter is just about to hit mailboxes. 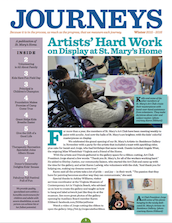 You can read it online here now to learn about how our kids are brightening the halls of St. Mary’s with their own artwork; a grandfather is volunteering at St. Mary’s, where his grandson lives; kids had a fun field day for Day of Caring; our principal is a champion for children; the We Promise Foundation made camp come true for our kids; and much more! This entry was posted in Journeys, newsletter by marcomm. Bookmark the permalink.